The teams behind the scenes at the Royal Opera House are always busy. 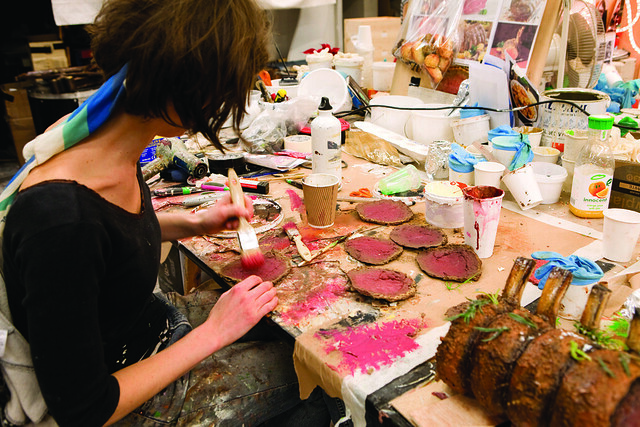 From the epic prop demands of David McVicar’s magnificent production of Berlioz’s Les Troyens to the mammoth task that faces the costume team for every revival of Christopher Wheeldon’s spectacular ballet Alice’s Adventures in Wonderland, all are hard at work ensuring that productions on stage live up to the Royal Opera House’s world-class reputation. The Props team occasionally has more appetising jobs – such as creating an array of fake food for Robert Carsen’s charming production of Verdi’s operatic comedy Falstaff. An entire banquet was created from latex, from a whole salmon to summer puddings and garden salads. View our gallery of prop food. The Costume Department is always a whirl of activity. Every return of The Royal Ballet’s classic production of The Sleeping Beauty sees the corridors and workrooms of Covent Garden filled with multicoloured tutus. Costume Workshop Manager Mal Barton showed us how a tutu is made, and gave us a glimpse into fitting Claire Calvert for her Lilac Fairy costume. This followed the dazzling insight into the costumes for George Balanchine’s aptly named ballet Jewels – a must-watch for fans of all things sparkly. With around 3,000 wigs produced for the opera and ballet companies, each Season presents new demands for the Wigs department. As well as producing headpieces for new production, the team also maintain those worn in revived productions – a staggering 100,000 wigs are maintained by the small team per year. Watch our short film about the wigs department. Discover more about the multimedia nature of opera in the exhibition Opera: Passion, Power and Politics, at the V&A Museum 30 September 2017–25 February 2018.